The Brian D. Hanley Fund was initiated in the memory and honor of Brian Hanley, a man who lived a very full, yet far too short life. Brian was raised in Waukesha, WI in a large Catholic family of five boys. His parents, David and Beverly, were strong believers in Catholic education, and Brian, like his brothers, attended 16 years of Catholic school. Brian was diagnosed with melanoma in 2002 which he battled for over two years. His wife, Julie, and son, Ryan, were the absolute focus of his life, and they supported him throughout his long and valiant battle against this difficult disease. Brian lived a life of passion and had a contagious love of life, whether it was riding his Harley, playing hoops with his brothers, or watching Marquette basketball. Brian attended Catholic Memorial High School and Marquette University and went on to lead a very distinguished career as a partner at Ernst and Young. He felt he was blessed throughout his life. Many of those close to him agreed and really wanted to be sure his spirit lived on well beyond his years. 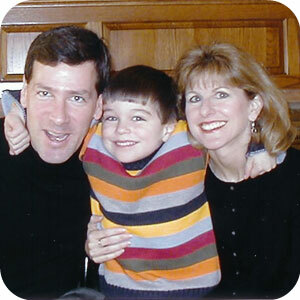 In his name, the Brian D. Hanley Fund was established in 2004, with many generous gifts from family and friends. Brian and his family had discussed how they could ensure that his spirit continued on and agreed that the Brian D. Hanley Fund would be a great way to continue to support education by giving those in need an opportunity to attend Catholic Memorial High School and Marquette University. Brian and his family saw this fund not only as a way to help facilitate a great education for those in need, but also as a way to help his friends, family and supporters work together for a cause they cared most about. For some, grants from this fund will help make the dream of a Catholic education a reality. Brian was always the glue that kept his family and friends close together. It was these family members and friends that decided that The Catholic Community Foundation would be “home” for the Brian D. Hanley Fund – a place where they, as advisors to this donor advised fund – could continue to keep alive Brian’s dream of supporting education.